Do you know what a smartphone costs? No, it’s not $100 or $200, but we can’t blame you if you think it is. Wireless carriers like AT&T, Sprint, and Verizon have hidden the actual cost of phones for years. They charge you a couple hundred dollars up front and hide the rest of the cost in your wireless bill each month, which you’re locked into for two years. While still a hefty $200, a subsidized smartphone is only a fraction of the $500, $600, $700, or even $800 you’d otherwise spend for a good phone at retail. Smartphones are so expensive that you can often buy an HDTV or laptop for less. So, we have to ask: why do they cost so much? What makes up the bulk of the price tag? To try and figure out what a good phone costs, we the most popular phone in the world: Apple’s iPhone 5. If we can determine how an iPhone actually costs, we’ll be well on our way. Unfortunately, the deeper we dig into the price of Apple’s popular phone, the more we realized just how much money Apple is making off every device it sells. But before we demand answers, let’s lay out exactly what we know. The first step to figuring out what a phone costs is adding up the price of all the components and materials inside it. Luckily, a lot of the work was already done for us. A site called iSupply releases a Bill of Materials (BOM) for many phones. Though not an official number, the site tears apart phones to figure out what’s inside every phone and does its best to estimate the cost of each component. Just like a computer, these many components come in varying shapes and sizes, and from many different places. There are dozens of components ranging from processors to displays to gyrometers, and they range in price from a few dollars to $30 and up. The BOM helps break down these costs. When you look at the BOM though, something doesn’t add up. The iPhone retails for around $650, but seems to cost far less to manufacture. According to iSupply, an iPhone 5 16GB model has a BOM of just $206.85. The hardware costs less than a third of the phone’s ultimate price. Even if you throw an extra $100 or $200 into the price of the phone to account for miscellaneous costs, we’re still missing some huge chunks of the pie. We’ve broken down the numbers below. This cost calculation is for the USA edition of both the iPhone 5 with 16GB of internal file storage and LTE connectivity. Every variation of a device has a different Bill of Materials, so even changing the color of a phone might alter its price by a little. The cost of components also vary widely based on their quality and what deals manufacturers have with their suppliers. Apple is known to cut very lucrative deals with its suppliers, obtaining parts at very low prices by ordering in bulk. Production: It’s difficult to pick specific numbers for production costs, but iSupply guesses that it costs at least $8 to manufacture an iPhone 5. We believe there could be more to this cost, but we’ve used their numbers. Licensing fees: We know smartphones like the iPhone 5 are subject to is royalties and licensing per unit sold. Since Apple makes its own OS, it doesn’t incur as much of a licensing cost as Android manufacturers, but it does strike deals as well. $20 is our best guess. Component and production price variations aside, the price of hardware only tells a fraction of the story. Beyond the Bill of Materials, many other costs come into play and they become more difficult to calculate. Like most companies, every three months, Apple reports its sales, profit margins, and operating costs incurred. 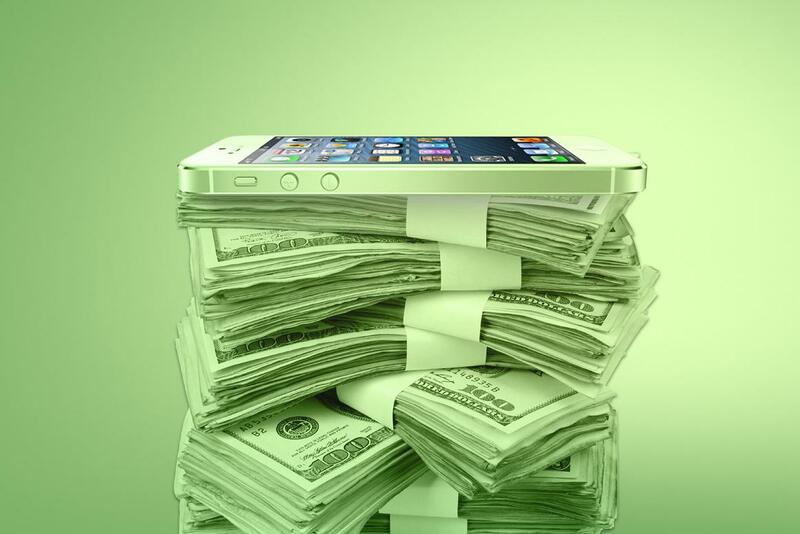 Because it makes and manages all aspects of its iPhone on its own – hardware, production, software, and even shipping costs – we can actually guess some hidden costs of an iPhone by using the quarterly reports Apple releases. Research & Development: According to its latest earnings report, Apple spent about $1.18 billion on “Research and Development.” R&D includes a wide variety of things, including iOS and all the software that comes with it. Since Apple builds its entire operating system in-house, and iPhones account for half of all sales (51.4 percent), we are going to do some napkin math and roughly guess that it invests half of its R&D into iPhones. Based on that guess, we can add a cost of about $589 million to the 31.241 million iPhones sold in the last three months. When you break that down per-device, it comes out to about $18.85 per iPhone. Selling, general, and administrative costs: The other costs that Apple incurs are “Selling, General, and administrative,” which include everything from paying the electric bill to Tim Cook’s salary. Shipping and storage costs for the iPhone also factor into this number. The amount, a whopping $2.65 billion, includes pretty much all other costs an iPhone could possibly have along the supply chain. When you cut it in half (again, a guess based on sales), you have $1.32 billion for iPhones to account for, leaving $42.33 to tack onto the cost of each iPhone. With our rough guesses for these hidden costs in mind, let’s amend our cost table for the iPhone 5, this time factoring in the costs you can’t see from the Bill of Materials. After doing the math, we know we can add at least $81.18 to the cost of an iPhone 5. So, it costs at least $288.03 for Apple to build (and run its operation around) its most popular device. The iPhone 5 16GB retails for $649.99. This is what it costs at an Apple store and what you’ll pay for it if you don’t sign up for a two-year wireless contract with your carrier. But this cost includes a retail markup. It’s difficult determine the exact markup but Apple’s balance sheet indicates it makes an average of $581.09 per iPhone. If we assume this is true, that gives it a retail markup of $68.90. Remember $581.09. We will use it again when calculating the profit Apple makes off of each phone. Apple sold a total of 31.24 million iPhones from April to June 2013 and had a gross profit margin of about 36.9 percent across all of its product lines. The gross profit margin is the profit Apple earns on all of the devices it sells when you include variable costs, like the cost of obtaining components and manufacturing a product, but not other costs like software development, sales, and administration. Though Apple’s total gross margin is 36.9 percent, it’s iPhone margin is likely much higher. Reuters estimated that Apple made as much as 49-58 percent profit margins on iPhones from Oct. 2010 to March 2012. The iPhone 5’s profits likely remain much higher than its overall margin, which is pulled down by the thinner profits Apple makes on the iPad and other products. Below is our final tallies for the $650 cost of an iPhone 5. So, the total should actually be Is Apple actually making more than $290 from every $650 iPhone sold? Most likely, yes. Keep in mind that while the $750 32GB model and $850 64GB model cost up to $30 more to produce, they each net another $70 in sales. Sales of the iPhone 4S and 4 likely make a heftier profit as well, since their components have come down in price. With that in mind, a 50-61 percent profit margin doesn’t seem out of reach, though there could be costs that we miscalculated or did not fully account for in our guestimations. Bottom line, though: Roughly half, or more, of every iPhone sale is profit. Apple is making a lot of money on iPhone sales. A lot. Because of the precedents it sets with the world’s most popular phone, smartphone prices only seem to rise in the United States. Manufacturers are looking for ways to lower the cost of production and price in other parts of the world, though. While a $700 smartphone isn’t uncommon here, buyers in developing countries will not, and cannot, pay that much for gadgets. As a result, manufacturers like Apple have been hard at work finding ways to whittle down the costs of building smartphones. Qualcomm, which builds a huge number of smartphone processors and cellular radios, is trying to to find ways to build low-cost, high-efficiency processors that can be sold in China and India, where the majority of its 2 billion+ residents have never seen smartphones, but will certainly want them as their level of income increases. As these emerging markets grow, smartphone makers and component builders alike will work tirelessly to build smartphones that are less powerful, but cheaper to manufacture. This could bring down phone prices in the United States, but we’ve shown no unwillingness to stop paying top dollar yet. There’s always the potential that high prices will push rebellious companies like Google to continue selling low-price smartphones like its Nexus 4, which cost just $300 at retail, but we see no signs that Apple wants to lower the retail price of its phone. That means higher prices up front, or higher cell phone bills. 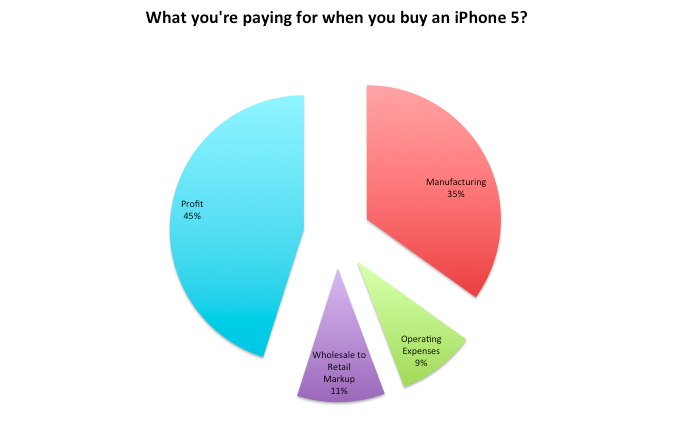 One way or another, you’re paying at least $650 for every new iPhone 5 you buy. Our numbers are not air tight, but they should give you an idea of what goes into a smartphone like the iPhone. Apple makes far more profit than any other phone manufacturer, but 50 percent isn’t unheard of for a highly successful company. Nike’s gross profit margin is about 43 percent. Levi Jeans also reports a 52 percent gross margin. Porsche is the only automaker to claim a 50 percent profit margin on its vehicles, but Tesla ranks as one of the best automobile makers, when it comes to profit, with a 17 percent gross margin, which it hopes to raise to 25 percent soon. McDonald’s gross profit hovers around 40 percent (yes, your cheeseburger could actually be cheaper than $1). Oh, and Burger King, it makes 56 percent. The iPhone may be expensive, but think about the cost of all the clothes you buy when you head out to the Gap or shoe store. We’re overpaying for more than just iPhones these days. Of course, if you want to find the biggest profit margin on earth, just look at your text messaging plan. Wireless carriers make as much as 10,000 percent profit with the rates they charge for texting plans.